The metro workers union of Sao Paulo, who represent labor in Sao Paulo subway, is calling an international meeting to address issues of privatization in the transport system, whether it is transfer of ownership to private companies, Public-Private Partnership or longterm concessions – and their effect on both the quality of transport and labor rights. On top of learning from each other’s experience on privatization and casualisation, international solidarity will be addressed. 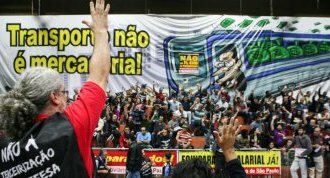 The meeting is scheduled for July 1-3, 2016 in the São Paulo Metro Workers Union headquarters, which is the place where historic battles for labor rights and against privatization have been held. Labor leaders and rank-and-file activists of all means of transport including rail, road, air and sea – are invited to join and to endorse it. Please submit documents and video to provide a report on your struggles on these issues. All proceedings will be streamed live on a channel. Also please register with us from January 4 through May 16, 2016.